Serco should be a familiar name to companies in and around the government contracting space. In this round of competitor highlights, we will take a look into Serco, Inc. the North American Division of the global, UK-based services provider Serco Group Plc. Incorporated in North America in 1988, Serco Inc. operates out of Reston, VA and employs approximately 8,000 people. In the company’s fiscal year 2017, Serco North America reported an annual revenue of $890 million, which included work driven from U.S. Federal, U.S. State, and Canadian customer groups. Serco’s North America’s business is fairly broadly defined in terms of service offering. This ranges from applications development/maintenance/modernization, IT enterprise architecture, contact centers, records management, facilities maintenance and management, logistics support, human capital and training. These are services areas many large GOVCONs provide. Serco deviates from many competitors with its narrow band of customers when compared to other large U.S. Government contractors. The bulk of Serco’s publicly available (non-classified) government obligations comes from two sources: Centers for Medicare and Medicaid Services (CMS) and the U.S. Department of the Navy. Figure 1 – Serco’s customer base appears to lack a certain diversity typical of many businesses their size. Note that the size and number of contracts between the company’s CMS and Navy portfolios is very different. Serco’s CMS obligations are driven primarily by a single contract – Eligibility Support Contract (see the contract section below for some more insight into this $1.2 billion program). Conversely, Serco’s Navy portfolio is made up of numerous, lower valued contracts with a range of Navy customers. The image below illustrates a high-level distribution of Serco’s Navy business by major customer. 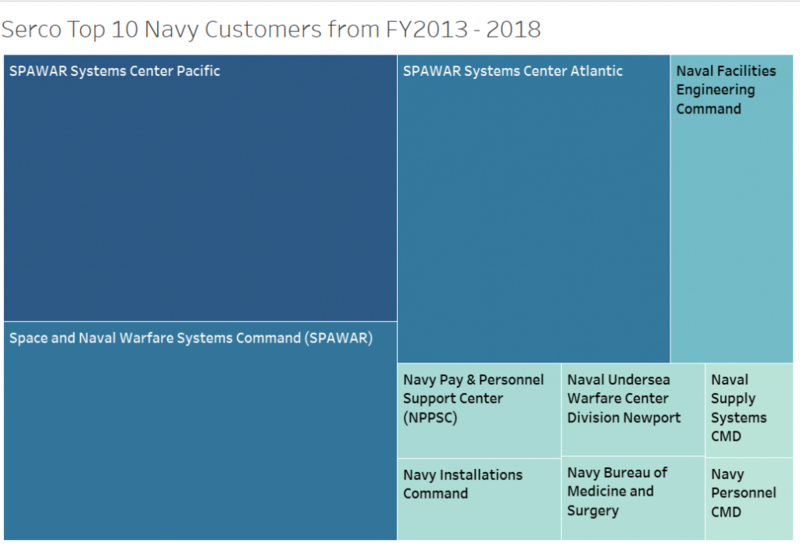 Figure 2- Top level spend with the U.S. Navy suggests a homogeneous customer base, but exploration of specific U.S. Navy customers Serco shows otherwise. In 2017, David Dacquino took on the CEO and Chairman role following the retirement of Dan Allen. He was originally brought onto the company as the Senior Vice President of the Defense Services Business. Serco has slowly and methodically added key hires over 2017-2019 to their executive team to recharge their growth strategy while maintaining focus on core customers. Craig Reed, Chief Growth Officer – Hired in January 2019, Craig has a diverse background from major GOVCONs (Northrop Grumman, DynCorp legacy Engility) and most recently President/COO and then on the Board of Directors for mid-tier GOVCON NT Concepts. He faces a challenge to charge up Serco’s ability to grow as their business strategy, which has not yielded anything significant in terms of growth with relatively flat prime (really a drop of -10% over federal FY2013 – FY2018) contract value. Tom Watson, Senior Vice President Federal Services – In April 2018, this SAIC veteran returned to Serco (he was a RCI employee much earlier in his career) to lead operations and oversee business development. Unsurprisingly, his his former role was SVP and General Manager of SAIC’s Navy and Marine Corps Customer Group. Serco is consistent in their customer focus. Karen Shields, Vice President of Health Services – Brought on in October 2017 and promoted in February 2018, Karen was previously the Director for Marketplace Operations at the Centers for Medicare and Medicaid Services (CMS). Picking up a high-profile former CMS executive who also served in industry (Lockheed Martin) maintains the company’s CMS business as crucial to retaining Serco’s base. Interesting that of the core leadership team, Kent Brown, Vice President of the C5ISR Business is the only one of Serco’s line leadership who has any significant tenure with Serco, having been with the business since 1995. Contrary to some of Serco’s GOVCON peers, the company has made minimal acquisitions. There are three primary acquisitions in their history that have led to the development of the Serco we know today. Serco made a significant acquisition to create the foundation of their Navy business when they acquired Resource Consultants, Inc. (RCI) in 2005. The 2008 acquisition of SI International to expand its IT capabilities and reach across DoD. The SI International acquisition was a major push for Serco to gain a better foothold in the military and intelligence community customer groups. Since the addition of SI International, Serco has focused mostly on organic growth. More recently in January 2018, Serco announced the acquisition of BTP Systems. This provides Serco with more capabilities in Command, Control, Communications, Computers, Combat Systems, Intelligence, Surveillance and Reconnaissance (C5ISR) including satellite and radar systems experience. Serco’s single largest prime contract is the Centers for Medicare & Medicaid Services (CMS) Eligibility Support contract, awarded to the company in July 2013. The company supports the verification of consumer eligibility for enrollment into a Qualified Health Plan and insurance affordability programs. The original contract ended in June 2018 with a final obligated value of $1.2 billion. Serco has since been awarded the 5-year, $948 million ceiling value follow-on to continue providing this service for the CMS. Serco’s largest on-going (non-classified) DoD contract award is for Sustainment for the Naval Facilities Engineering Command (NAVFAC) Anti-Terrorism/Force Protection (AT/FP) Ashore Program. Awarded in December 2015, Serco provides lifecycle sustainment for Physical Security/Access Control and Command, Control, Communications, Computers, and Intelligence systems. This 6-year contract has been funded for $119 million under a potential ceiling of $214 million. Running from July 2009 through January 2016, the National Benefits Center (NBC) Records Support contract awarded to legacy SI International is responsible for most of the company’s business with the U.S. Citizenship and Immigration Services (USCIS) customer. With a total of $324 million in federal obligations, this contract provided comprehensive records management support services. Serco lost the recompete awarded to FCi Federal in September 2015. Where does Serco go from here? Serco’s BTP Systems acquisition is a good hint at where the company hopes to expand: growing business with national security and intelligence community customers. In general, the company has been very quiet on the M & A front (BTP was not a large buy). As we continue through the era of consolidation, will Serco make any major acquisitions in the coming months? A new Chief Growth Officer to revitalize their declining (remember that -10% figure?) prime contract revenue…can Craig Reed get it done? Will they push into new service and customer areas or double down on existing core customers (CMS, Navy)?